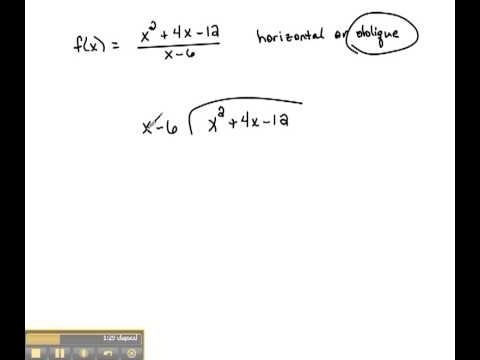 This is a great instructional video on how to find oblique asymptotes of rational functions. Let us take the example f(x)= x square+4x-12 over x-6. Now we have to find the horizontal or oblique asymptotes of this rational function. The higher power here is x square which is at the top and hence we have to find oblique asymptotes of this function.When we divide x square+4x-12 by x-6 we get x=10 and the reminder is 48. Now you can easily write down the final answer. The oblique asymptote for the rational function f(x)=x square+4x-12 over x-6 is y=x+10.